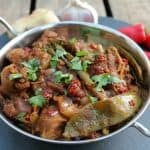 A delicious warming lamb curry cooked in your slow cooker. Heat the oil in a wok or frying pan and fry the onions for 2-3 minutes. Add the garlic and ginger and fry for another minute or two. Add the spices and red chilli and fry for another minute or two, then add the tin of chopped tomatoes and water and bring to the boil. Turn down to a simmer and cook until the sauce has thickened, and most of the water has evaporated. Add salt to taste. Once the sauce has thickened, transfer it to your slow cooker pot. In the same wok or pan, fry the lamb cubes for 4-5 minutes (no need to add any more oil) until brown all over. Add the lamb and vegetables to the slow cooker pot, stir to combine, and cook for 4-5 hours on high or 7-8 hours on low. Garnish with fresh coriander and extra red chilli, if you like, and serve with basmati rice.